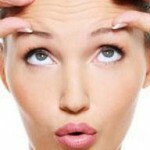 # Avoid factors that cause skin aging and thus wrinkles. In this category falls mainly unprotected exposure to ultraviolet, radiation and smoking. # Protect your skin. Use a day cream with SPF of at least 15 – the texture of this product varies, depending on your skin type can choose: spray, cream, lotion or gel. It would not be bad to wear a hat – not only protect the skin, but also your hair. # If lipstick is showing signs that it would “leak” from his lips, reverse and apply lipstick first, finishing with contour drawing. Do not forget to apply a moisturizer first. # Use the powder compact – not only will the best makeup, but also contribute to its sustainability. Make sure you use a fine, open shades (it would be preferable certain derivatives of yellow color, looks much better than the translucent shades of pink). # Last but not least, learn to love yourself and be happy as you are. Wrinkles are beautiful, and you if you approach them so! Reflects the experience you have accumulated! # Use a protective sunscreen with an SPF of 30 or more, because – although it may seem hard to believe – the sun is far more damaging in the winter, as reflected by the bright white snow. # Remember that the lips contain no sebaceous glands, so the hydration and feeding them depend solely on you. It would be better to use matte lipsticks, to orient more likely to gloss, in turn enriched with SPF. # Use different creams for different parts of the body because the skin is more sensitive in some places.